Because we haven't seen the likes of your kind for quite some time, you created quite an uproar with our children yesterday. I'm uncertain about your specific anatomical workings, but if your antenna are even remotely sensitive, you likely heard that uproar. From the seven-year-old: "Mom, mom, mom, mom, mom -- there's a ladybug! A ladybug! It's a ladybug!" From the four-year-old: "Come here, you little ladybug. You're so cute! I'll hold you." From the two-year-old: "Bug. Bug. Bug. Bug! BUG!" Your delicate ladybug wings momentarily fluttered, as if you were poised to dart toward freedom, yet you held your ground. She spit you out and began a strange, contorted dance that resembled someone walking on hot coals while gargling. It was at this point that I seized my opportunity: I rescued you, carried you to the sliding glass door, and gently flicked you from my palm into the great outdoors. It wasn't even thirty degrees outside, but I hope you understand my reasoning: I simply thought you'd be safer. Stay warm, little ladybug, stay warm. So funny!!! A few weeks ago I heard my youngest in the playroom shrieking in terror. I thought surely she had sustained some sort of serious injury. Alas, there was a ladybug crawling on the wall. Obviously, she is terrified of all bugs and I cannot even imagine how she would have reacted if it had flown into her mouth!!! "I simply thought you'd be safer"- Hilarious. And, no doubt, true. Well, I think that she, too, would have done the "hot coals while gargling" routine. It seems to be a natural response to an insect landing in your mouth. So funny! 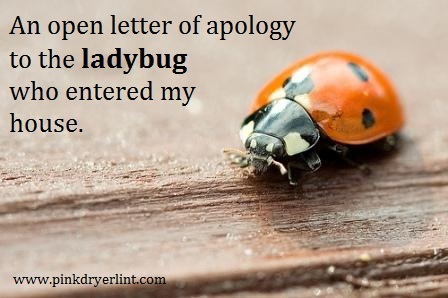 It's been awhile since we've seen a ladybug too, I'm afraid! What an awesome, exciting post! I felt like I was right there with you.